Leviton Decora® Heavy-duty straight blade single receptacle in ivory color, has nylon body and face. It measures 4.06-Inch x 1.312-Inch x 1.142-Inch. It withstands current rating of 20-Amps and voltage rating of 125-Volts. 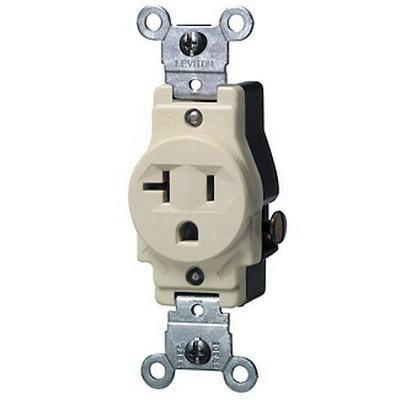 This 2-Pole 3-Wire narrow body receptacle has NEMA 5-20R configuration. This commercial specification grade receptacle has 0.031-Inch thick brass double-wipe contact that provides the strength and conductivity. It has power rating of 1 hp and dielectric strength of 2000-Volts. Zinc-plated steel strap receptacle offers side-wired connection. Receptacle accepts solid/stranded wire of size 14-10-AWG. Tamper/impact-resistant receptacle withstands temperature rating of -40 to 60 deg C. Receptacle is ideal for commercial and institutional application. Receptacle is UL listed, CSA/NOM certified and meets NEMA/ANSI standards.